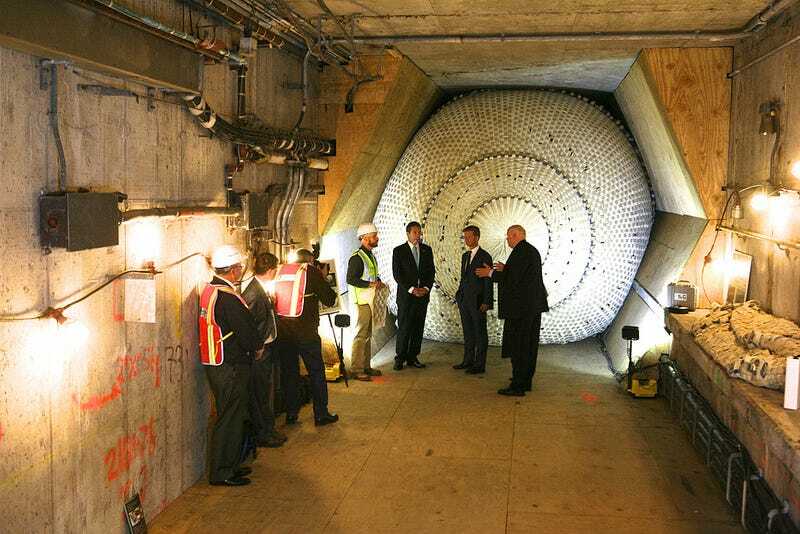 After Hurricane Sandy decimated the subway system last year, officials pledged to install new devices to help halt the rising tides—including flood gates and, more intriguingly, a device called a "tunnel plug." During a "Sandy Resilience Tour" last week, the MTA unveiled a working prototype of the plug, which was installed over the summer for testing. The strong inflatable tube deploys from a folded-up wall panel to fill every nook and cranny of the tunnel where it's installed—halting not only flood waters, but also smoke from fires, gas attacks, and other perils. The plug was designed by a Delaware company called ILC Dover, which contracts for the DoD and NASA (their logo is a tiny astronaut). In fact, the super-tough material they use to build the plugs is similar to the stuff they use to make space suits. Originally developed as part of a project for Homeland Security, these plugs are designed to withstand 17 pounds per square inch of force using a super-strong pressurized plug with an internal capacity of roughly 35,000 gallons, according to a PhysOrg report. Though it's unclear whether the MTA plans to deploy the plugs in working subway stations, it seems likely that we're about to see more of them soon—the NY Daily News reports that ILC Dover is testing a similar tensile "curtain" at the 207 Street subway station in the Bronx. And they won't just be used in subway stations: Similar deployments could stop passage through stairwells, hallways, and other spaces. Image via MTAPhotos on Flickr. Lead image by Governor Andrew Cuomo on Flickr.